QTY 1234567891011121314151617181920212223242526272829303132333435363738394041424344454647484950515253545556 Please select a quantity. This slim and modern looking floor lamp is perfect to give home atmosphere a glowing look and setting a welcoming feel for guests. Made up of metal, marble and fabric, this white-colored floor lamp can be used in the living room, bedroom, office reception, or other areas that needed an accent. The marble base will save the lamp from falling, curved arm supporting the adjustable fabric lamp shade so that the light can spread at aimed area or wherever needs. 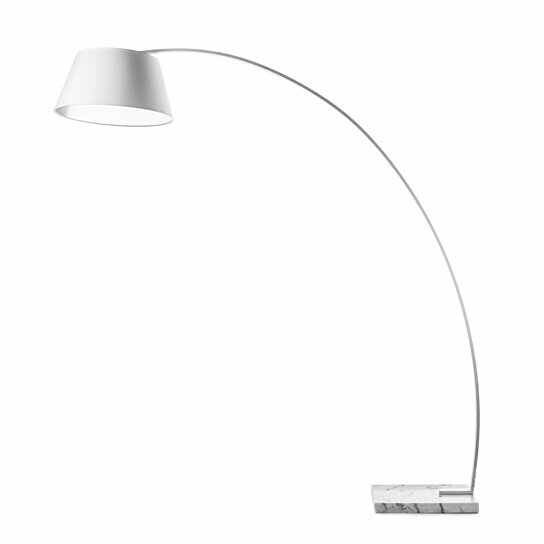 This floor lamp also consists 36 inch power cord for easy use. Put one 60 watt bulb in the holder to show off your high-tech lamp glow. Assembly required. Made up of marble, metal and Fabric, features a black finish, a great blend of sturdy materials.